This pizza recipe takes me back to my high school days. My friends and I would make a late night run to Applebee’s, share an order of spinach and artichoke dip, some flavored iced tea, and some good gossip. Good memories! 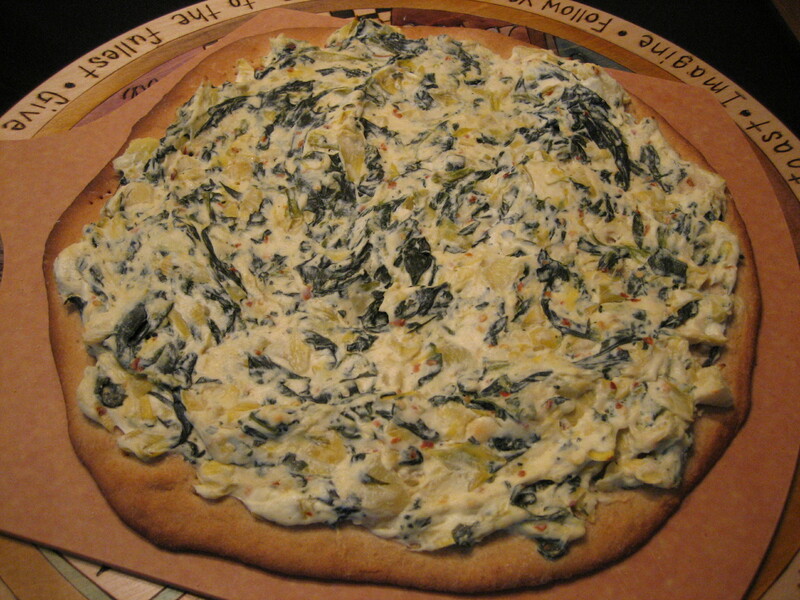 I still enjoy spinach and artichoke dip, but I have never attempted to make it so this was a first for me. My mom shared her recipe, which I combined with Alton Brown’s recipe for the dip. The combo called for frozen spinach, artichokes, cream cheese, mayonnaise, sour cream, parmesan cheese, garlic salt and crushed red pepper. My mom also provided a tip for a creamier dip, use more mayonnaise, less cream cheese. Andrew loves cream cheese so I didn’t take my mom’s tip, and man the dip was thick! It may have been super thick, but it turned out to be a delicious pizza. Andrew’s first reaction when he bit in was “Whoa, it’s rich!” The flavors blended well together and the crushed red pepper gave it a nice kick. Move over Applebee’s!